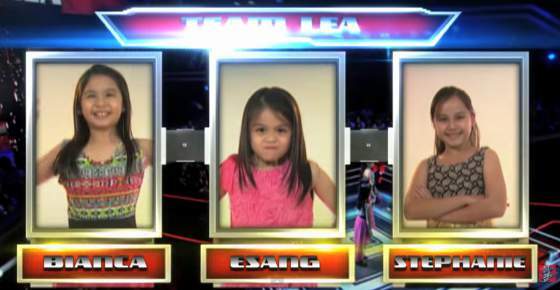 VIDEO: Esang defeats Bianca and Stephanie in The Voice Kids Philippines Battle Rounds - Balita Boss! Team Lea young aspiring singers Bianca Marbella, Telesa 'Esang' de Torres and Stephanie Jordan sang "Somewhere Out There" by Linda Ronstadt on The Voice Kids Philippines Season 2 Battle Round, Sunday, August 2, 2015. Coach Bamboo picked Bianca, while Coach Sarah chose Esang. Coach Lea also chose Esang, the 8-year-old ‘Small but incredible Diva from Tondo.’ as the winner in the three-way battle. She will advance to the next round of the competition – the Sing-Offs.